The final Chapter in this story, and one that is still being written today, was the creation of the Ziegenbein Award. 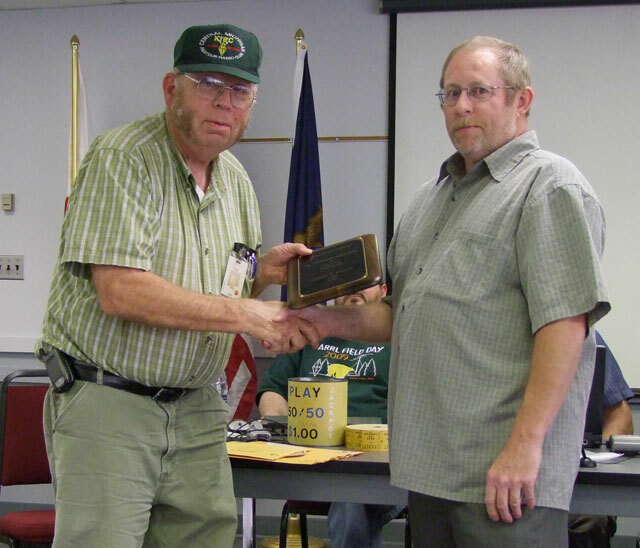 This award is presented each May to the Full CMARC member who has contributed the most to Amateur Radio, in general and CMARC, in particular for the previous calendar year. 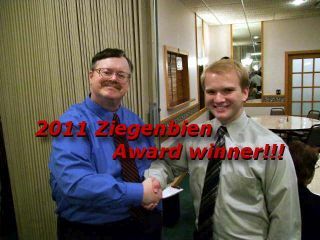 The Ziegenbein Committee consists of recipients of the award for the previous three years. The recipient must be a full, current member of CMARC. Nominations to be made in writing, in your own words, no chain letters to be accepted, stating nominees contributions to CMARC and Amateur Radio. All nominations are to be kept secret until award is presented. All nominations are to be mailed (regular postal mail OR email). The same person can receive the award more than once. The Committee shall consist of the last three recipients; the senior member shall be the chairman. All nominations are to be closely checked and discussed by the Committee. If the Committee feels the nominees are not deserving, the award does not have to be given. Nominations are to be submitted before March 15th of each year, so the Committee can make the selection and have the plaque engraved. The recipient will be announced at the annual Ladies' Night. 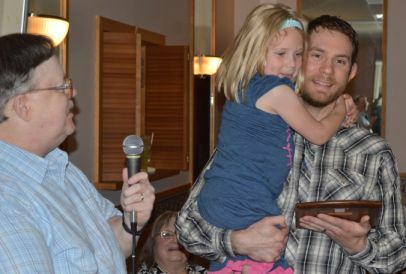 Don McLain KB8RAD presents the 2014 Ziegenbein Award to Dan Beuchert WX8MOJ with daughter Abigail at the 2015 Ladies Night Banquet on May 8, 2015. Compared to some, the recipient of the Ziegenbein Award this evening is a relatively “new” Ham, yet has had a positive impact on CMARC way out of proportion to their years. In that “brief” time, this Ham has served as a certified SKYWARN Weather Spotter, has been active at Field Day, has been a worker at our Hamfest, has volunteered for many of the different Public Service Events in support of their community, has been an active member of ARPSC and LCDRA, is the CMARC ListServ manager and web manager for the ARPSC, has helped teach CMARC's Technician classes, was Co-Editor of our Club Newsletter (the SCOPE), and has done things as menial as setting up and tearing down tables and chairs at our meetings (even sweeping up the floor and taking out the trash afterward, being the last one to leave the building). This receipient has even shoveled and salted the sidewalk at our meeting place in Winter! But this receipient has also done something as lofty as serving on the CMARC Board of Directors (most recently as President). This person led CMARC with dignity and a cool head and was equal to any task or situation that presented itself. 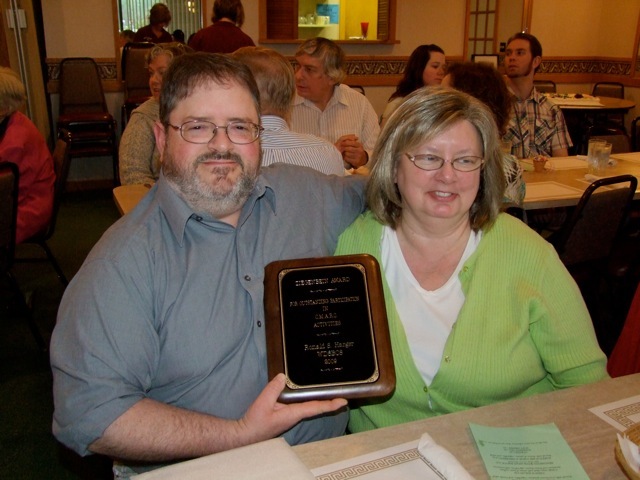 By now you ALL know who I've been speaking about and as you can see, the role this person has played during the short time of his being a Ham Radio Operator makes him the undisputed choice for winner of the 2014 Ziegenbein Award! Therefore, it is with great pleasure that the Ziegenbein Award Committee bestows CMARC's highest and most prestigious honor upon this deserving Ham. Introducing the winner of the Ziegenbein Award for the past calendar year of 2014....Mr. Daniel M. Beuchert, WX8MOJ! CONGRATULATIONS, DAN, on a job well-done!! The recipient of the Ziegenbein Award this evening has been a licensed Amateur now for about 18 years. In that time this Ham has served as a certified SKYWARN Weather Spotter, has helped with Field Day, has volunteered for the many different Walk-a-thons and other events in the community, has served as a Director on the Board of CMARC for at least a half dozen years (as Secretary for at least two), has been the Cards and Flowers Chair for at least a half dozen years, has helped with the planning and implementation of the Ladies Night Banquet and the CMARC Hamfest in recent years, as well as, back in the '90s, has also helped with kitchen duties at Club meetings and has been the Club Printer for years. There are many other things they have done to help our Club "behind the scenes", but suffice it to say that whenever the call went out for help, they always responded with, "YES!!" 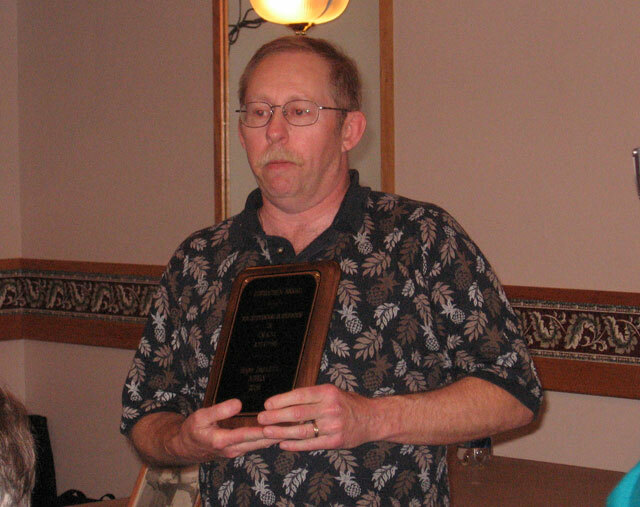 As you can see, the role this Amateur has played over the years in Ham Radio and CMARC makes them the undisputed choice for winner of the 2013 Ziegenbein Award! They have been passed over for this Award since the '90s and we think it's high time that they be acknowledged. Therefore, it is with great pleasure that the Ziegenbein Award Committee bestows CMARC's highest and most prestigious honor upon this deserving Ham. Introducing the winner of the Ziegenbein Award for the year 2013.... Mrs. Jane Hosford, KC8FSK! CONGRATULATIONS, JANE!! You have worked long and hard and are truly deserving of all of our appreciation for your dedication to our Club and Hobby! 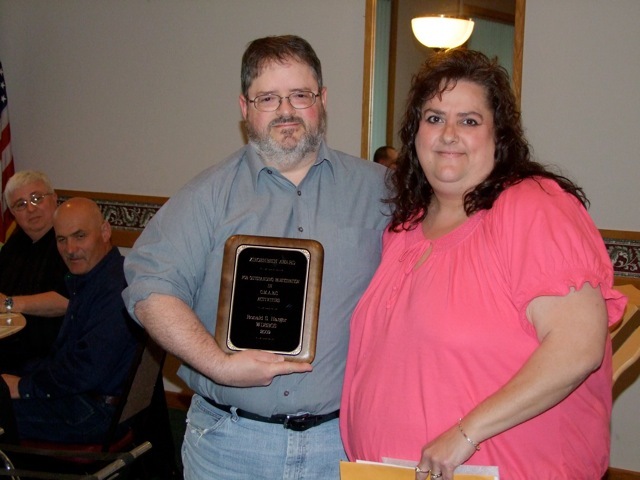 “Introducing the winner of the Ziegenbein Award for the year 2012.... Mr. John Hosford, KC8QZB!” John is a very humble and unassuming person, who doesn’t do anything for recognition or praise, but just because he wants to help! He truly has that “Ralph Ziegenbein” attitude, because after all, it's not just WHAT a person does but WHY they do it that counts, right? John never complains or utters an unkind word; he is kind, patient and more than willing to help! Working as Co-Chair of Field Day for 4 years and operating a Field Day Station for 6 years, donating his own equipment, trailer, and time. Active for years volunteering his time, talents and equipment for the many Walk-a-thons he’s volunteered to help work. When a Club antenna needs to go up or come down, you’ll always find John there...willing to help, and recently when CMARC needed a table for the Board in the Club Room, he bought one and then donated it! In 2011, at our first Trunk Sale, John helped haul things back and forth in his vehicle, with his gas, from the Club room. He sat up and tore down canopies, sat up tables and chairs and then at the end of the day, carried them back to where they belonged. He worked tirelessly and at the end of the day, when KB8ZXR (the Hamfest Chairperson) couldn’t take one more step, John was still asking what he could do to help her out! CONGRATULATIONS, John! You are truly deserving of all our appreciation for your dedication to our Club and Hobby! 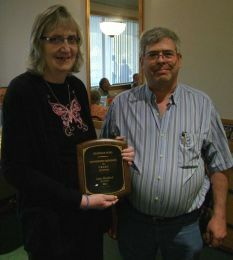 Don McLain (KB8RAD) was honored as the 2011 Ziegenbein award winner! Don has spent countless hours actively promoting and supporting amateur radio. He has served on the CMARC board for many years, including serving as Vice President and filling in wherever and whenever needed. Don founded the “Breakfast Club Net” specifically to encourage licensed amateurs to actually USE their license priviledges. Don also founded the “Lending Library”, “RAD’s Coffee Break”, the “Mid-Michigan Information Net”, and serves on the Ingham County VE Team. Congratulations, Don, and thanks for all that you do! 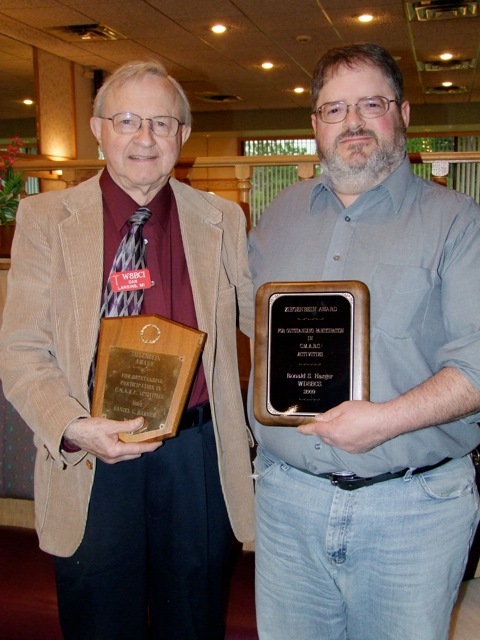 Bob Berger (K8RDN) was honored as the 2010 Ziegenbein award winner! 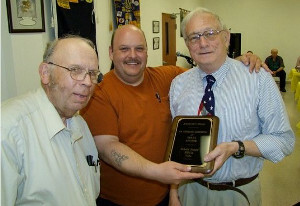 Bob served for several years on the Board of CMARC and specifically worked as the Vice President. He has been actively involved in local, state, and regional traffics nets, helping hams be prepared for emergency traffic handling. We thank Bob for his service to the hobby, and to CMARC and are honored to announce he is now part of a historic group of Ziegenbein winners. 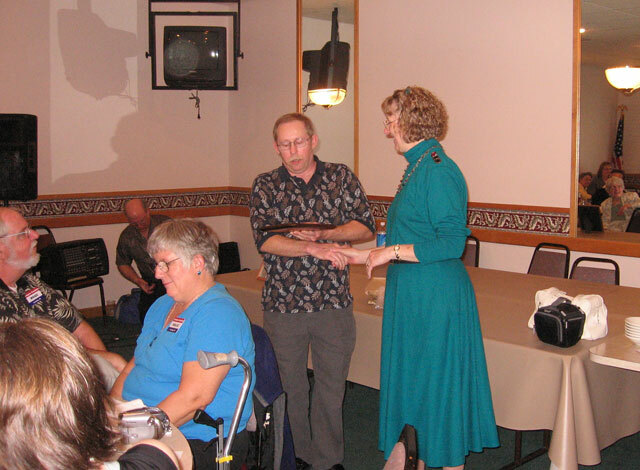 Roger Barnhill (AB8RX) receives the 2007 Ziegenbein Award from Pam Denomme (KB8PSF) at the Annual Ladies' Night Banquet on Saturday, May 2, 2008. CONGRATULATIONS, Roger! 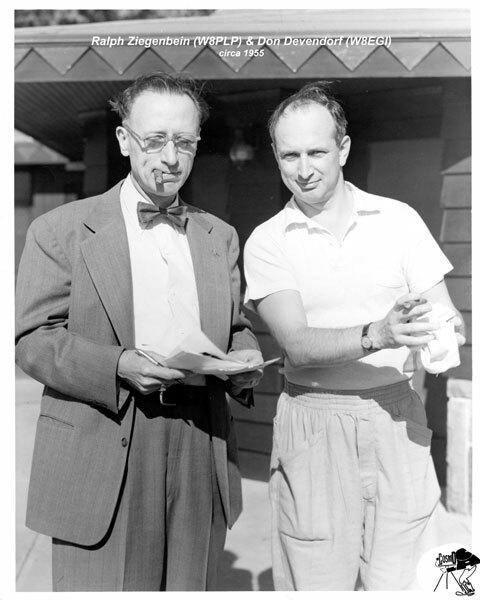 Who Was Ralph Ziegenbein (W8PLP) ? Some members wonder for months, or even years about the annual award CMARC bestows on its most active and contributive member. Some even struggle with the pronounciation of the award's name, but after reading this bit of information, you can amaze your friends and relatives with the story...and the man behind it. Ralph Ziegenbein (pronounced Zig-en-bine) held Amateur Callsign W8PLP. He was popular barber in the Lansing area, with a shop located on Michigan Avenue, near Clemens and made a large impact on our Club. "He would ask if you were a Ham when you came into his shop", said longtime CMARC member, Currin Skutt (W8FSZ). "If you said yes, he would open a drawer and hand you a QST, if you said no, he would direct you to the magazines on the table." There is little information on the man known affectionately as "Mr. Ham Radio" and he has no Family in the area, according to Currin Skutt, but he is remembered as the man who spearheaded the push to bring the Novice Class license to Amateur Radio. According to Currin, Ziegenbein came up with the idea, sent it to the Club Secretary and had it typed up for submission to the ARRL. 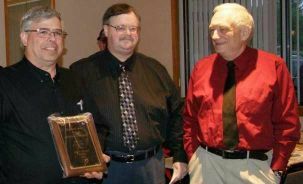 "The League took it from there", Skutt remembered and Amateur Radio added the Novice Class to its list. Ziegenbein was among the last of the sparkgap users in the Lansing area. Currin tells a story about how Ralph's transmitter would weld the electric meter when he used his transmitter, which caused some problems with the electric company. A man of good humor, Skutt also told of Ziegenbein's homespun phonetics. "He called himself a modular fruit stand", said Skutt. "Peaches, Lemons and Prunes". W8PLP assured himself a place in the hearts of CMARC members of that day. Currin shared that Ziegenbein was a "man of his word. If he told you he would do something, you could expect a report on it at the next meeting". His dedication to the Hobby was apparent and Skutt also said the Lansing barber never missed a meeting. A member of the Quarter Century Wireless Association (QCWA), Ziegenbein was traveling to the Upper Peninsula for a meeting in 1960 when he and his wife were involved in a terrible auto accident near Houghton Lake, Michigan. Ziegenbein died in the accident, but his wife was taken to a Grayling hospital with injuries. Following his death, Currin tells that a group of Hams known as "The Lush Wells" (all CMARC members) decided to preserve Ziegenbein's callsign, "If not for the Club, then for a worthy organization." After navigating a sea of red tape, the group's efforts were rewarded and W8PLP was issued to CMARC for the station at the American Red Cross, Lansing Chapter shortly thereafter.